Thanks for showing up Hucka D. Now let’s admit up front that after the humorous yet still disastrous meeting between Baker Bloch and myself, we’ve decided not to do this particular interview in SL “real time” shall we say. Instead it will be created as a Microsoft Works document at the home computer and retroactively plugged into our very short meeting on the dock here the other day, where I took several snapshots. These snapshots will merely serve as location shots now. So let’s get this out of the way immediately. You’re not a small African American boy are you, or African in any way? No, my color is black is all. I became small and condensed to fit into the eyeball avatar. All 3 of us decided it was the best thing to go through. I am the third “i”. Would you like to tell us about this transformation in Rodeo? Well (walks a little closer to Baker Blinker on the deck they are standing on), we jointly know now that to get from Hucka D., the standard City Chic avatar provided by the Lindens, to Hucka D. the large purple custom designed avatar in the future, this transformation had to come about. Now it is a situation of connecting the lines to make a whole picture. We just knew that we had to start by drawing a line between point 1 and point 2, as it were. Why don’t we sit on the bench over here. You must be tired from your day of transformation. So this transformation happened in SL time only right before this interview? Let’s say it happened several days ago. Although when you took the snapshots you will provide in this post, yes, the transformation just happened. Let’s treat real time as when the interview is actually being written, which is, well, now. Present time. I am able to step out of Hucka D. and view the letters on the screen being formed. That is when this is occuring. The transformation in the eyeball was prefigured by the collage I, Baker, and I suppose, we, Baker, created shortly before beginning this blog. I, we, tried to create something for Hucka D. to find in the future in the corner of the Rodeo sim, just in the gulch north of what we’ve been calling in spots the “Isle of Baker – Not”. Baker B. and Hucka D. went to this location before the blog. Another colleague called Booker T. did not make the trip, although he claims he did. He was there and not there at once. He also claims to have seen the eyeball in actuality, as a 3d object in SL that is, while I, baker b., only remember it retroactively through the collage I created, where I just stuck a cut out of an eyeball onto a screenshot of this location, this hot corner. Is this another place where time/space get mixed up, like the area around Enceladus-Tethys Falls perhaps? Yes. That’s why I had to go back and finish the unfinished business. The eyeball had to be there. That was my responsibility. I am the third. When this occurred, you had, suddenly, knowledge of the future. Like Laura Dern’s character in INLAND EMPIRE. Well, this is why I’m interviewing you. We need you now, all 3 of us, to relay information about this future that you now have access to. I know it comes in bits and pieces, but we must start to tap. Right. As we agreed. Let’s get up again and walk around the deck. I think better if I’m moving around. This place is special. More so, for us anyway, than other places in SL. This is where I will land my van. This is where I will show the Big Two. This is where it begins. In SL. By Big Two you mean Dark Side of the Rainbow and 2001-Echoes, or what Mike Johnston likes to call Jupiter and Beyond the Infinite. And you’ll have your yellow submarine van. Yes, that will be created/rezzed shortly, just as in your Sandbox post. Are you the 4th then as well? Well then, why is it so important to show the Big Two at this location? Kansas City Life has already had a showing in the tree house in another part of the Sansara continent, to the south of us, considerably south. Kilometers and kilometers. That is also a special place. I am having some trouble triangulating between all the locations we have wanted to call home in this virtual reality so far. But Kansas City Life, in another way, is Second Life. Kansas City is the second city of Missouri — St. Louis being the first. Translated, that means “Second Life”, then. But the name, obviously, has nothing to do with Second Life causally. K.C. Life was created in 2002, I believe, before even the conception of Second Life, or at the very best around the same time. Interesting, perhaps. That would actually be 2001. Going on 7 years ago. Do you wish to talk about the relationship of Kansas City Life to Dark Side of the Rainbow? That’s already been covered elsewhere mostly. K.C. Life is ½ of Dark Side of the Rainbow with an added hole or void. In this hole or void comes the possibility of two over and above one. Two movies. This begins the presence of the Second. In the future, as you’ve already guessed, Virtual Reality and what we call Reality itself will blend more seamlessly together. This is just the beginning. The synchronicities are strong even now. This is the pull of the future. Future possibilities. Future realities. This is information we need from you. This future version of Second Life. It will not be called such. But it will also not be a game. We have excellent footing here. This is where it all begins. 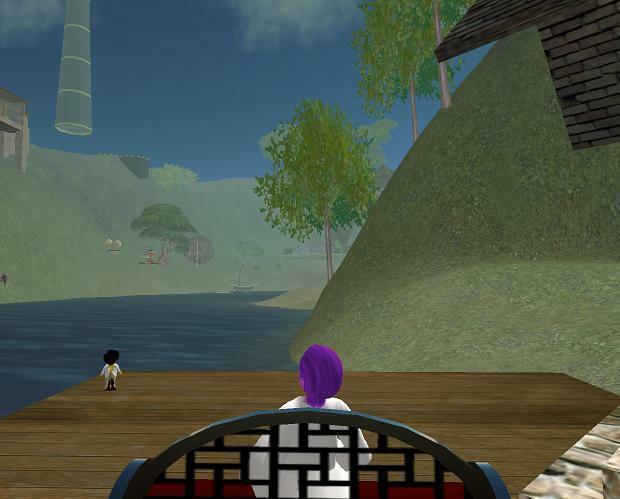 Second Life should not be forgotten. That’s your responsibility; that’s the responsibility of others. Second Life, like the Centerville of the *second source* of Kansas City Life, is a contrast of high and low, like your underwater peak that is claimed by the Ancient Ones to be the highest of the low peaks of this reality. 17.56 meters high — remember those numbers. It is also 57.61 feet high. This is a symbol of Second Life itself as seen by these Ancients. Now right next to the Hilo Peak is a much higher peak that the Ancients considered an abomination or basically worthless in comparison despite its greater height. You should insert a picture of that peak into your blog. It is called by the Ancients the Split Mound, even though it is not fractured in the way normally thought of. It is fractured because it is partly underwater and partly above. The surfacing of this mountain above water begins the life of Second Life beyond Ancient times. This begins the rule of the Lindens, the people of Lime. Lyme. I’m breaking down. I believe there’s a pitcher of water in the house here if you need refreshment. You’ve already talked quite a bit in this, um, interview. Interesting information. I was also going to talk about Baker Bloch, and why Mr. Low had to meet him exactly 199 seconds after Bloch first manifested in Second Life. Now, Baker was one second late, which greatly irritated Mr. Low. Mr. Low is an Ancient. 200 seconds represents the second itself. There is a two minute hole in Kansas City Life that represents the city of Centerville, the very center of it all. This is virtual reality, but also virtual reality fitted seamlessly into reality reality. You will not be able to tell the difference between the two. *I* cannot tell the difference. In the end it doesn’t really matter. All realities are virtual. Something else will be shown here, won’t it? Yes. A Strange movie. Dark Side of the Rainbow and 2001-Echoes are not movies themselves. To create a movie, you must have multiple movies. Are you tired? Should we end here? You need to ask more about Mr. Low and the Ancients. Ok, I’m asking. What’s the relationship? Oh, I remember. I was going to ask about Baker’s Island! Ok, so I *went* to Baker’s Island, in reality, which is actually a small planet on the limit of the SL solar system, as it were. But it is also the moon of SL itself. But I was there. However, I was also merged with a shake creature, a cup formation, to create Shake ‘N Bake. You remember that post with the snapshots… it was waiting for me in the [delete name] sim. I now know this is connected to the entity that likes to call itself Shakenstein. You will shortly meet Shakenstein again. He claims to have written The Bible plus all of Shakespeare’s plays at once. He fits angels on the head of a pin. I have no memory of actually getting free of this shake creature, though. The first memory I have again is of creating the art seen in the Mooniplutonianites post here. There’s a specific reason. Although I do know important bits and pieces of the future, I cannot actually tell you much. It is up to you to remember. Vague memories. Two… circles and squares. No, cubes and spheres. Baker Bloch is the last pea in the pod. HBA reads this after waking from the thrice reading of the earlier post and begins to cry. That’s very nice! I have a lot of fun w/ these kind of posts. At a certain point in the very near future, though, I have to check out “canonical” sources for pre-Linden lore, which basically means Salazar’s material and also your connected tale of transformation in the Cowell sim. I’m not sure how the Ancients tie into the former shamanic civilizations of SL yet, if they do. But I want to pay respect and understand the things that have been written before on the mythology of SL for sure. Next step, perhaps: scanning old SL forums that I know Mr. Jack posted on concerning these subjects. And, certainly, any info you can give me on your own transformation will be helpful, if anything resonates with what I’m gurgitating here. My guess is that the Ancients had their main city at basically the same location as Linden City, and traces still remain. The Man may be some kind of link. And the Delerium Castle (?). But I’m still working on the overall theory… nothing really fixed yet. I might call it “Centerville”. And humour is a necessary ingredient in the search. Can’t be too serious about oneself! I *really* need to read the old forums. It’s just that i have a pathological hatred of forums. I can hack them – too much, too fast, can’t keep up, argh!!!! Still, I shall brave them, if only to get to Salazar’s posts to better know my new home and my journay across it. My small scribblings are, I hasten to add, far from canon. I merely had an idea one day and pop! it all came tumbling out. Even now I have no idea where it is going or what will happen. I have some loose ideas about how it will tie to Sal’s stuff, but in no way expect him to agree with it. My basic idea is that behind all reality lie energy forces – The Elementals. Some are tied to this world, others to SL (I suppose other to all forms of worlds). In one form or another the residents of these worlds have used and abused the powers available to them via these Elementals and this has led to the destruction of the world Linden later ‘found’. How this ties into Sal’a Great Erase is unclear… mainly because I haven’t thought that far ahead and I know the timescales don’t match. I think (and no more than that right now) that my great war happened a long time ago… the world recovered but then something led to its erase (Sal’s erase) in the recent past. I’m thinking along the lines of a secret cult of shaman-types that tried something that went wrong. not sure yet – like I say, this is all half (or less) formed ideas in my noggin. Did you notice I just mentioned Atlas in the Cracks in Space, etc., Part 2 post? I explored the underwater area there extensively a week or so ago. Or Baker Bloch did. 🙂 Beautiful sim. This is some great food for thought… thanks very much!! I’ll begin more research almost immediately I assume. I’m not sure where I’m going with my fabrications either. I did read up on Myst the other day using a SJack lead, although I’m unfamilar with that VR otherwise. The Great Erase is something that may need further clarification for sure. I also wanted to add that I did think of the loose connection between what I’m calling simply Ancient Ones and Lovecraft’s Old Ones from his Chthulu mythology. But I don’t see my Ancients as malevolent as Lovecraft’s. They’re still a little creepy, admittedly, as Baker Bloch puts it. But funny appearing at the same time. So I’ll probably study a bit that angle as well. I’ve heard of Myst, but never played. People who have are deeply in love with it though so it must be amazing. I missed the Atlas connection! I shall have to follow your trail, my friend! Lovecraft’s a great writing of ideas if not style. And ideas trump style in my book. Probably the scariest writer I’m familiar with. Eat your heart out Steven King. I’ll send you a map of my journeys in Atlas-Tethys! The Atlas Bay was amazing all around. Tell you what I’ll just make a special post and add the pictures I took that day.